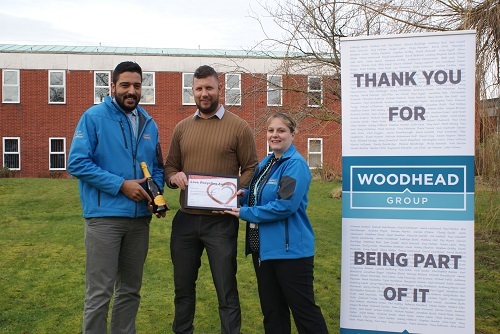 Robert Woodhead Limited is one of thirteen organisations in the East Midlands have been rewarded for their love of recycling. The environmentally aware construction contractor achieved a 98.5% average recycling and recovery rate across building sites in 2017 and also introduced environmentally-friendly initiatives combined with a number of sustainable developments including the new Sherwood Forest Visitor Centre in Edwinstowe. The score places the site at the forefront of industry best practice demonstrating the very highest level of achievement. The award winners, seven in Nottinghamshire, five in Leicestershire and one in Derbyshire, have made significant efforts to increase the amount of waste they recycle, resulting in recognition from resource management and recycling company, Wastecycle, which has presented the companies with a Love Recycling Award. (L-R) Paul Neal, Robert Woodhead Limited, Jack Fletcher, WasteCycle and Kerri Grocock, Robert Woodhead Limited, receive the love recycling award.